Breitenbrunn lies not far from Czech-German border, about 17km far from Boží Dar. 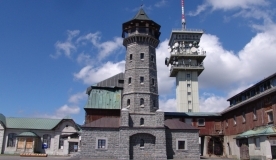 Breitenbrunn offers several different exhibitions focused mainly on the history of mining, mineral processing and others. You can also visit there a historic manufacture producing paper from wood, an exhibition about the history of winter sports and more. The exhibition includes over 1,100 exhibits, which are located in the exhibition halls and in the open air. Inside, you will find mining equipment, rescue equipment, work clothes etc. Outside, you can see mining carriages, drilling equipment and other technology. You will learn further information about the history of mining in the region since 1380 during the guided tour in the St. Christopher Mine. Naturally, the tour is led by a well-informed guide and visitors are provided by helmets and protective clothes. Energy gained from the hydroelectric power station drives a 100-years-old machine for producing cardboard… You can see for yourself in the local technical museum how wood is turned into cardboard. In Antonsthal, you will be taken 180 years back to history and guided through the methods of mineral processing on devices powered by water power. In addition to technical equipment (water wheels with a diameter of 4-8 m ore crusher, etc. ), there is an exhibition of historical hand tools for processing minerals.